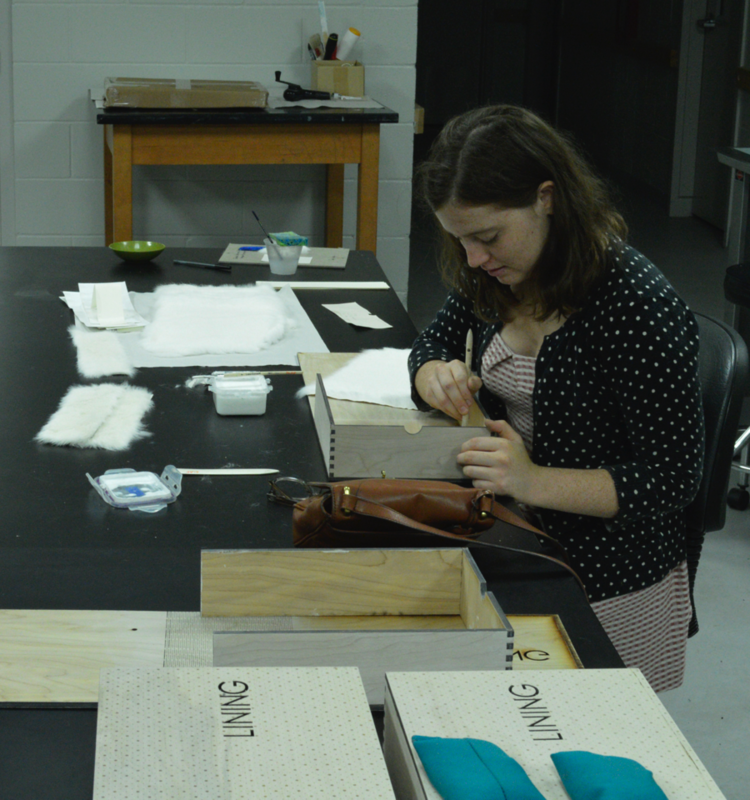 SCAP intern Alexis Beucler assisting with the binding of a SCAP book project, Lining. BFA undergraduate student, Alexis Beucler, was chosen by Denise Bookwalter to receive the Janice Hartwell Printmaking Award for spring 2015. Professor Emerita of FSU, Janice Hartwell, donated the award to the Printmaking area in order to honor one outstanding student in the printmaking department. Beucler has worked as an intern for Small Craft Advisory Press since summer 2014, and has been a valuable contributor to SCAP’s mission of making experimental collaborative book projects. The printmaking area combines traditional and contemporary printmaking practices in a non-toxic printmaking studio in order to provide a dynamic educational experience for the contemporary printmaking student. The printmaking curriculum focuses on intaglio, relief, screen printing and the book arts. The introduction to printmaking class prepares students with a rigorous foundation in the processes of printmaking while the intermediate and advanced classes provide opportunities for hybrid, experimental, collaborative and digital practices. All classes and studios maintain a non-toxic contemporary printmaking practice that highlights safety without compromising quality.